I never think of myself as a primer person, but then when I was moving rooms I realised that I actually have an amazing number of primers. The problem is I've never found one I really liked using. Until now. Life being life, I've now found two stunning, very different primers. In two very different price ranges; one that costs £11 & one that costs £28, one that makes you look radiant & one that makes makeup apply better than I have ever had makeup apply. One for perfecting under makeup and one for perfecting makeup. 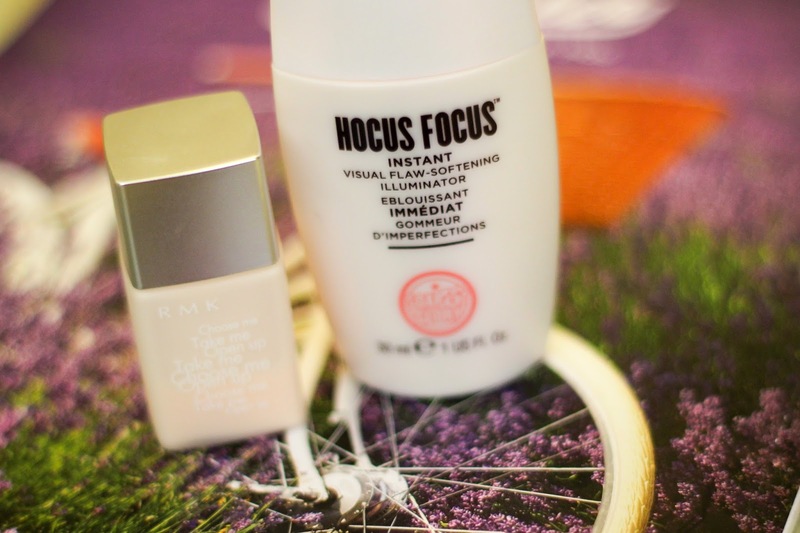 I'm going to start with the Hocus Focus primer from Soap & Glory. You've got to love a brand that has such cool product names & you've really got to love a brand that creates such amazing products. This primer is glow-y & illuminating & reminds me of the MAC Strobe Cream. Honestly though? I like this more (which, considering the MAC version would be £3 more for a comparable quantity makes it a bargain). The problem with the MAC one is that it's not an especially good primer, it doesn't really extend the life of my makeup & it's quite a white glow. This such a stunning peach-y, golden glow that is you seriously cannot detect on the skin. All you see is the incredible glow (if you've seen my "Bulls**t people say about M.E." video this is what's was making my skin look so good). Plus, this smells of soap & glory products, & although I don't usually like scented makeup I haven't been reacting to this - however sensitive my skin has been feeling - & the smell isn't so strong that you notice it especially during the day. It's a very subtle scent but a pleasant one. From Boots this costs £11 for a 30ml bottle which is a really good price for a primer in my (seemingly extensive) experience. The RMK base is unlike anything else I've ever tried. The formula is water light, refreshing & almost serum like. It reminds me of the Caudalie SOS serum in texture but it is a very different product. The formula is peach toned...more a super pale pink but (on me at least) it blends into invisibility. But the difference it makes on the skin is incredible, I will never be able to apply makeup without this again! This smooths out & perfects your base until makeup applies like a dream. You could seriously apply anything on top of this and it would apply perfectly. Plus, if your foundation has gotten cakey anywhere (as always happens for me when I mix concealer with a powder foundation) you can just blend a tiny amount of this on-top & it fixes the problem. The pot in the picture is a 15ml sample pot I got in a birchbox, a full size bottle contains 30ml & costs £28. However much I don't want to admit it, that is £28 I am going to be paying for the rest of my makeup wearing days, this stuff is incredible! What are your favourite primers or have you never found one that works for you?